Laughing, crying and simmering with rage, that’s now possible on Facebook. Just over a month ago, Facebook introduced the new reactions. For years users demanded an additional Dislike button. But Mark Zuckerberg did not want people nor products to be evaluated negatively on his platform. Instead, Facebook strategists devised the inflated Like button. In addition to conventional Likes the user can now choose between five new emotional reactions: Love, Haha, Wow, Sorry and Anger. But what do these new options mean for administrators of Facebook pages? Do the new reactions have an impact on reach and interactions of posts? Today we provide the first detailed analysis of Facebook reactions. We analyzed more than 1.3 million posts. We have incorporated data of more than 40,000 Facebook pages worldwide. The most important findings are summarized in an infographic at the end of this article. 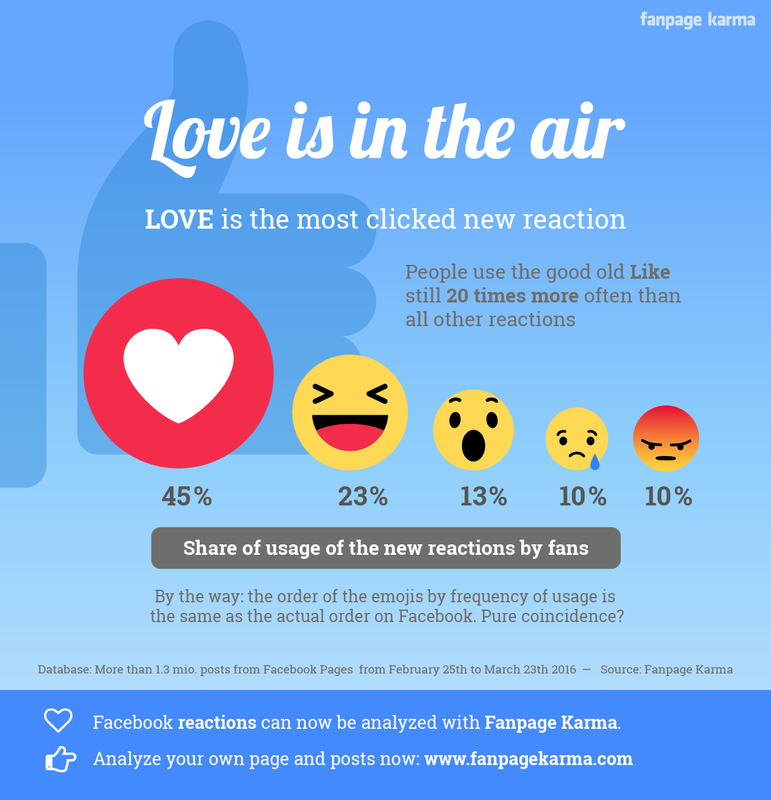 The most popular reaction of Facebook users is Love. That´s how Facebook calls it, when a user hits the little heart button instead of choosing the old-fashioned thumb. 45% of all measured new reactions were Love. Far behind the Haha (a smiley laughing out loud) with 23% percent. The Wow, a smiley in which it is not entirely clear whether he is surprised or frightened, made 13% of the new reactions. The two negative emotions Sorry and Anger only made 10%. Interestingly, that’s mirroring exactly the order in which the buttons are arranged on the Facebook interface. Probably no coincidence. Facebook extensively tested the new feature in several countries and made many adjustments before the reactions were made available for users worldwide. Compared to the new reactions, users still select the conventional Like 20 times more often. This has probably two reasons. First, the Like button is sufficient for the user’s needs. Users are accustomed to the Like button and a simple Like is often enough to express their consent. Secondly, the new reactions are visible only when the Like button is pressed or held for a longer time. Especially for mobile options, it takes extra time to place a Love or Wow. Users must consider a post to be very valuable to spend that extra energy. Posts have to be very emotional to evoke that extra energy in a user. Unfortunately, most posts on Facebook pages tend to be not very emotional and therefore trigger no special reactions. The new reactions can also be used to classify posts. A post which evokes many Hahas seems to be a funny post. If a post mainly gets Sorry reactions, it’s sad news. We took this information to observe what kind of emotional quality a Facebook page predominantly sends. Facebook pages seem to alternate between two extremes. 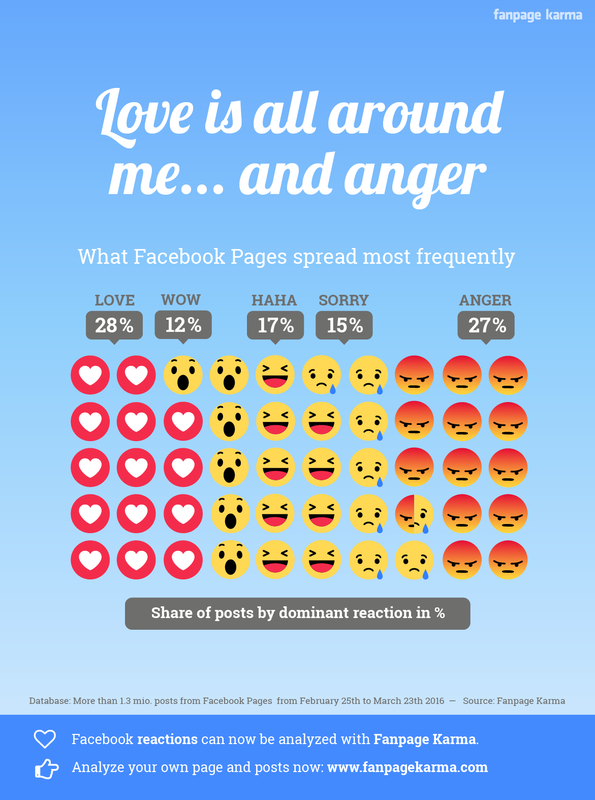 The most common content posted show Love- (28% of posts) or Anger reactions (27% of posts). These two opposites make up more than half of the entire posts. Funny posts (posts where the most common new reaction was Haha) account for only 17% of the posts, sad posts got nearly the same results with 15%. Events like the death of a celebrity provoke this reaction. Just 12% of posts reviewed managed to get a Wow reaction. The frequent use of posts causing anger and neglecting funny posts is a waste of potential as our study shows below. The reach of a post on Facebook depends primarily on how much fans interact with the posts. Every like, comment and share leads to a wider reach. And since recently, each Haha, Love, etc. does, too. Currently, it’s Facebook’s policy to rate every reaction equally. Like or Love – there is the same reach bonus. This allows an interesting analysis: As long as Facebook stays neutral towards the reactions, the different reach and reactions of posts shows how the emotion of the posts affects the users. For example: are funny posts commented more often or are sad posts shared more frequently? The outcome is clear-cut. Posts that are not just liked but as well as emotional that at least 20% of the interactions consist of the new reactions, have a 2 to 3 times higher reach. Posts that mainly generate Love- and Haha-reactions do have the highest reach. The reach is 3.2 times as high as for those posts that primarily collect Likes. Similarly successful are those posts commented with Wow. On average, their reach is 3 times as high. The negative emotions Anger and Sorry are significantly less successful. They are seen just 1.9 and 1.8 times as often as unemotional posts. If available, the link is opened exceptionally often with sad posts. On average this is done 4 times as often as for unemotional posts. Only Wow-posts get more clicks: 5.5 times as often. Videos with lots of Wow-reactions are watched more often. 6.7 times as many users do watch these videos. Videos that make people laugh (Haha) can keep up with this result by a factor of 6.2 compared to an unemotional video. However, posts marked with Love are shared most often. Anger evoking posts which are used frequently by many Facebook pages can’t keep up in any of these categories. They score best when it comes to comments. 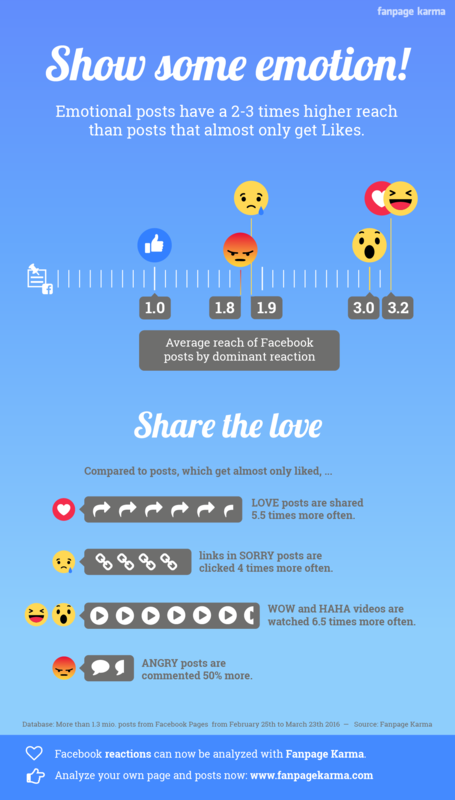 Anger-posts lead to 1.5 times as many comments as an average unemotional post – but Love and Haha-posts can do that as well. The message for every social media manager: content has to be emotional and should be capable of provoking preferably Haha or Love-reactions. The introduction of reactions has led and and will lead to more changes in the newsfeed. While users used to have the option to show their agreement by hitting the Like button, they are now able to express different emotions. This means a post can collect interactions of several user groups that take in the content of the post quite differently. For example, the post of German politician Volker Beck announcing his resignation from various political functions because of drug abuse got most diverse reactions. While his fans expressed their sympathy by hitting the Sorry-button (755 Sorry-reactions), other Facebook users simultaneously showed their spitefulness with 542 Haha-reactions. Probably inconvenient for Volker Beck personally but concerning the reach of this post a clear advantage. The extra 542 Hahas led to the newsfeed algorithm showing the post more often. The new analysis options are as well interesting for page administrators. For them, it is now so much easier to understand if posts are written and designed as emotional as necessary and which emotions their posts do cause. What kind of humor do my own fans have? What do they love? 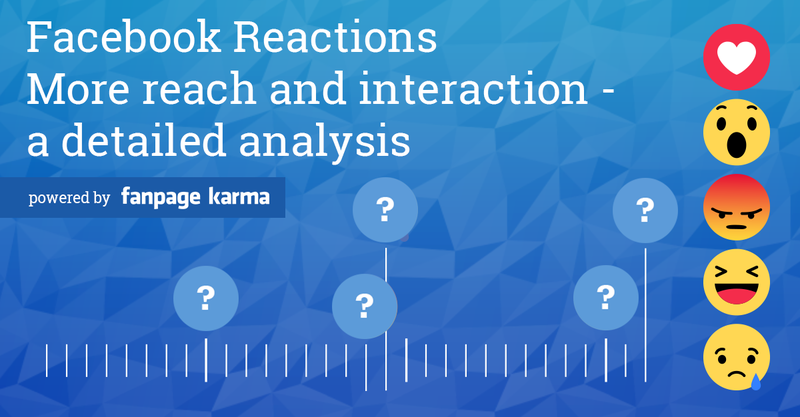 Tools like Fanpage Karma deliver the full evaluation for these important questions.